APRIL 11, 2016, SEATTLE, WA - Uptime Institute, the globally recognized data center expert today announced the appointment of R. Lee Kirby to President of Uptime Institute. Kirby had previously held the position of Chief Technology Officer, providing thought leadership and technical vision. Julian Kudritzki retains the position of Chief Operating Officer and now takes on the direct leadership of important new strategic initiatives for the company with the new Efficient IT and Corporate Governance Advisory Services, standardizing global data center portfolios, and reducing resource consumption in IT infrastructure. "These changes are intended to streamline reporting relationships, further align the organizational structure, and support global industry leadership,” said Martin V. McCarthy, Group Chairman and CEO of The 451 Group, Uptime Institute parent company. “Lee Kirby has driven the maturation and adoption of operational services and has played a key role in our strategic growth during his 3-year tenure at Uptime Institute. 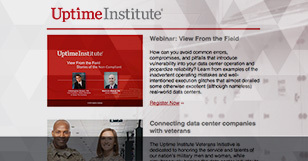 In his role as COO, Julian Kudritzki, a veteran of more than a decade at Uptime, has been fundamental to the success of Uptime Institute’s Tier Certification Services and now plays a critical role working directly with me as we broaden our position in the data center with strategic initiatives geared toward Efficient IT and IT Governance. We are all proud of the accomplishments of these talented individuals." Kirby has more than 30 years of experience in all aspects of information systems, strategic business development, finance, planning, human resources and administration in both the private and public sectors. His core technical competency has focused on improving the performance of critical infrastructure through sustainable solutions that reduce power and water consumption across all industries. His leadership from business strategy development and a focus on sustainable operations has repeatedly driven value to all stakeholders. In addition to his years as a successful technology industry leader, Kirby had a successful military career of over 36 years (Ret. Colonel, US Army) and continues to serve as an advisor to many veteran support organizations.